The Oregon State Beavers and Kansas State Wildcats will round out the last super regional match-up, commencing game one on Saturday evening at Goss Stadium in Corvallis, Oregon, home of the Beavers. The Beavers enter the NCAA Tournament looking to advance to their fifth College World Series appearance in school history and first since winning back-to-back NCAA titles in 2006 and 2007. Oregon State will host the Wildcats at home, where they have won 14 of their last 15 games, all part of a solid 25-4 record at home this spring. After cruising through regional play, capped by a 6-1 victory over Texas A&M in the Corvallis Regional Championship game, the Beavers advanced to their fifth super regional since 1999 (four of which have been held in Corvallis). Oregon State comes into supers with a strong 48-10 record, which can be argued to be supported by perhaps the strongest aspect of their game, that of starting pitching. 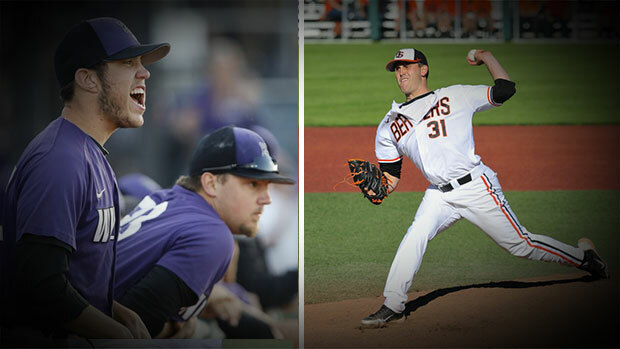 The Beavers have a strong starting rotation comprised of Matt Boyd, Andrew Moore, Ben Wetzler, and Dan Child, each of who have pitched like staff aces throughout the season. Andrew Moore posted a 13-1 record and 1.22 ERA in 111.0 innings, while Matt Boyd pitched to a 10-3 record and 2.20 ERA in 114.1 innings of work this season, leading the Beavers’ pitching core to a tremendous 2.13 team ERA, amongst the best in all of college baseball. Oregon State is not quite a one-dimensional team for that matter, as they boast a strong offensive core led by Pac-12 Conference Player of the Year Michael Conforto and a .290 team batting average. Kansas State head coach Brad Hill understands the challenge ahead for his Wildcats. But don’t sell the Wildcats short, as they boast the second highest team batting average in the country (.324), led by fifth round draft pick Jared King as well as hit-tandem comprised of Austin Fisher and Ross Kivett, who are both batting .363 coming into super regionals. As the Wildcats look to advance to their first College World Series in school history, the Beavers look to stop Kansas State’s bid and inch their way closer to a third NCAA title. Oregon State will send Matt Boyd (10-3, 2.20 ERA) to the mound against Kansas State’s Joe Flattery (5-4, 3.87 ERA) in game one, which commences at 7:00 PM on Saturday. Game two will follow on Sunday at 10:00 PM and if necessary, game three will be played on Monday at 7:00 PM.